A slow resurgence in laboratory design projects is revealing important lessons: do more with less, do it faster, and do it smarter. In tough economic times, construction projects often are early victims to budget cuts. During the recent recession, research laboratories were no exception. Many laboratory construction projects were delayed or canceled. However, a majority of architectural, engineering, and construction (AEC) firms surveyed by R&D Magazine say the laboratory construction business is picking up again. Still, the industry is facing a "new normal" as the types of laboratory projects, client expectations, priorities for sustainability, budgets, timelines, and methods for designing and managing the building process evolved amid the new fiscal realities. Many of these changes will result in better facilities, say laboratory design experts. While 2010 and 2011 were relatively flat years for the AEC industry, 2012 "shows promise for a gradual increase in activity; but indicators are still suggesting a bumpy climb," says Steven J. Riojas, senior vice president and national director, science and technology, HDR Architecture, Omaha, Neb. During that time, the design industry saw many projects halted, canceled, or scaled back. Client organizations merged, closed sites, and reduced staff. This contraction had a ripple effect on design firms, and they had to re-adjust staffing, design efforts, and strategic planning. Institutions and corporations took more conservative approaches to facility development, leading to fewer new construction projects, some renovation work, and more studies to plan for capital improvements. Enrollments increased at universities, but their "budgets do not allow for the expansion of new facilities," says Robert Thomas, principal, science and technology at Leo A Daly, West Palm Beach, Fla., "and existing facilities are being renovated in an effort to accommodate these larger numbers of students and researchers." Today, the laboratory design process is characterized by a "more, faster, smarter" mindset. Laboratory owners may need to maximize funds in a short timeframe. Designers are developing leaner processes for delivering projects and leveraging technology—like building information modeling (BIM)—as a means of doing so. The question has become: How can we get more science into less space? The answer is simple, but complex in execution: Do more with less. "We've seen a trend in reduced gross square foot per person, but steady growth in the number of projects and inquiries in recent months," says Rick Kobus, senior principal, Tsoi/Kobus & Associates, Cambridge, Mass. Not all outcomes of the recession were negative, according to Randy Kray, director of programming and planning, science and technology, HOK¸ Atlanta. "As the North American market shrank, the industry looked to international markets to maintain revenue," he says. In North America, the emphasis on renovation and rehabilitation of existing laboratory infrastructure helped grow firms' understandings of how spaces can adapt to new programs and make systems work more efficiently. As financial pressures challenge the conventional design process, "the notion of less customized laboratory space is more widely accepted, adjusting to meet the need for more wet and translational research spaces," says Erik Mollo-Christensen, principal at Tsoi/Kobus & Associates. 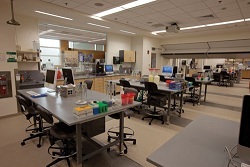 Previously, laboratories had been designed "historically," says Laurie Sperling, president of Health, Education and Research Associates (HERA), St. Louis. New laboratories were based on the average square footage of previous facilities. "The problem is that these buildings can be five, eight, even 15 years old—basically out of date," she says. "Philosophically, we avoid looking backward when approaching design. Rather than asking what a researcher or instructor wants or needs, we probe." A laboratory built with flexibility in mind—not custom-built for any one researcher or initiative—can far outlive its initial use. The result: Cost-driven laboratory owners and users expect efficiency, flexibility, and robust utility/engineering systems in their facilities. As research itself becomes more complex and interdisciplinary, more collaboration between scientists and their institutional partners is needed during the design process. The last five years have also seen a marked increase in the level of scrutiny applied to projects to assure maximum return on investment (ROI). The early design process demands greater economic analysis of lifecycle costs to reduce operating and energy costs and optimize environmental performance. "Clients are risk averse and want to know that new facilities or renovation projects will meet their vision and strategic business goals, in a data-driven way," says Rachel Nelan, principal, Flad Architects, Madison, Wis. "More emphasis is being placed on researching and documenting the design concepts being developed, and incorporating lean principles, where appropriate." "Recently, as a result of economic pressures, project schedules for the planning and design of laboratory facilities have been accelerated. These accelerated schedules require additional effort to maintain quality," says Michael Reagan, vice president, Stantec, Cleveland. To offset the schedule expectations, we have developed techniques and processes that expedite decision making. To offset unrealistic budget expectations, we have concentrated on providing life­cycle cost and other analyses that address the pros and cons of the capital cost options." The new construction versus renovation decision is contingent on many factors including location, cost, schedule, and flexibility. The client organization must identify the useful life expectancy target for the facility up front, so a proper feasibility study can be conducted. Each facility is different. "If site location is their priority, renovation may be the only choice. If operating costs are paramount, new systems may be key," says Sperling. Arguably, the most expensive part of renovating a research facility is downtime. With this in mind, AEC firms typically evaluate the associated costs, benefits, and disadvantages of renovating versus new construction through decision matrices and BIM to help clients make informed decisions. During initial planning stages of laboratories, analyses compare the cost of new construction with the additional costs and savings that can be realized with the renovation. A construction manager can analyze the capacities of the existing facility to determine what will trigger significant infrastructure upgrades, and which building code and technical requirements must be followed—such as health and safety, security, vibration, and high-bay requirements. "We look at it from a return on investment," says Josh Meyer, managing principal with Jacobs Consultancy, New York. "If the renovation doesn’t get them at least 25% more capacity in staff or equipment space, we recommend against it, unless it's an architecturally significant building. In that case we may recommend downgrading its use to dry computational from biology." In 2011, R&D Magazine readers identified functionality, space, safety, and flexibility as the four most desired characteristics of a facility. These four characteristics are interconnected in laboratory design; changing one of these features affects the others. While functionality and safety are never compromised, space and flexibility may be sacrificed due to budget constraints. Typically, reducing space is the simplest and quickest way to reduce cost. Informal meeting areas, open lounges, and other spaces that enhance collaboration and interaction have been labeled as "soft space," says Meredith Bostwick Lorenzo Eiroa, associate director, Skidmore, Owings & Merrill (SOM), New York, and "is continually thought of as residual space within a research facility. At SOM, this 'scientific glue' is foremost and central to our design process—it is purpose-built into our building programs, and essential for 21st century learning, scientific processes, and translational research." Flexibility is harder to define, but reducing a facility's flexibility may mean the loss of spare engineering capacity and space for anticipated growth. "Many owners say they want future flexibility, however, lack the understanding to define what 'flexibility' means," says Daniel Joseph, project manager, McCarthy Building Companies Inc., St. Louis. "We explain to clients that as a concept flexibility has different meaning to different people. We help them define the concept in terms related to their research needs and the cost associated with it," says Lee VanDeKerchove, principal, science and technology studio leader, Harley Ellis Devereaux (HED), San Francisco. HED works with clients to understand that long-term flexibility, which will benefit them over the life of the building, is based on standardized and modular laboratories that can be customized using a "kit of parts" approach. "This approach maximizes functional space; organizes distribution of lab and building systems, minimizing first costs; and through selection of appropriate casework systems, provides a complete design solution that is safe, functional, flexible, efficient, and cost effective," says VanDeKerchove. Functionality, flexibility, design objectives, and compliance requirements should be identified using visioning, basis of design, space program, and user requirements specifications, says HOK's Kray. The iterative process between programming and concept design helps further refine the project's desired characteristics. "Once the balance between these criteria is established through a concept, the design resolution and system selections optimize the success criteria as much as possible," he explains. "Functionality and flexibility together are design qualities that allow a facility to do more in less space," says John Martell, senior laboratory planner, The Freelon Group, Durham, N.C. "Sharing a single space between two or more departments is a space-saving opportunity that is relatively easy to recognize during programming. But we can also be vigilant for opportunities to program a single space that will serve multiple functions." Collaborative, interdisciplinary facilities that support and promote the sharing of equipment, technology, and resources are growing in popularity. Researchers want to modify their laboratories quickly, inexpensively, and without facilities personnel, says Stantec's Reagan. "It is better to settle on an approach early in the design process," says Riojas, as "adding flexibility after the fact can be prohibitively expensive." Strategies to build flexible, collaborative research environments include the use of casework systems that are easily moveable, limiting fixed elements in the laboratories, and containing hazards in the smallest workable area. Movable and height-adjustable laboratory benches with only minimal services are the norm in the interior of laboratories. Piped services (such as water, natural gas, and vacuum) serve perimeter benches only, says Reagan. Sustainability has become a laboratory standard, as owners move toward an emphasis on lifecycle operational costs and become much more aware of the impact that a facility has on the environment. 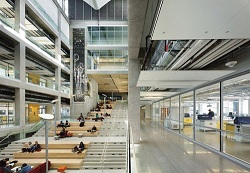 In addition, a green building can help attract new students, faculty, or researchers. Laboratory owners now expect more efficient and sustainable buildings and set U.S. Green Building Council goals of Leadership in Energy and Environmental Design (LEED) Silver, LEED Gold, or even LEED Platinum for their facilities. Still, other facilities take a holistic approach to reduce costs. "With this in mind, energy conservation becomes critically important to our clients," says Andy Vazzano, corporate practice leader, science and technology, SmithGroupJJR, Chicago. "What becomes less important is the actual certification of a building. However, LEED is still the standard in our industry and because of its notoriety, it is still necessary. LEED certification can lead to greater funding from donors." Some academic laboratories strive for higher levels of energy efficiency, with a goal of net-zero energy buildings. These facilities may seek a Living Building Challenge certification, a strict building sustainability performance standard promulgated by the International Living Future Institute, says Sperling. Research facilities—particularly those involving chemicals, biologics, and nanotechnology—are expensive to build and operate given the requirement for large volumes of outside air for ventilation. Most laboratory owners are aware that the utilities loads and once-through air requirements can make designing an energy-efficient laboratory a challenge. However, demand-based systems and more efficient engineering can not only yield operational savings, but also reduce design difficulty. High-performance and low-flow fume hoods, and air and lighting monitoring systems are examples. Occupancy sensors on fume hoods can reduce airflow when the laboratory is unoccupied; isolating chemical fume hoods in alcoves reduces the overall volume of air required for safe operation. "Use of air sensing technologies is gathering momentum and acceptance as owners and designers recognize the enormous benefit of being able to set lower baseline air change rates and, in certain cases, the ability to recirculate exhaust air," says Ben Elliot, senior associate, Perkins + Will, Atlanta. Increasingly, chilled beams are being used as a means of addressing ventilation and heat loads. While the previously accepted norm was traditional heat recovery wheels and chillers, chilled beams have proven effective in maintaining lower air change rates per hour and reducing sizing of ductwork and central air handling equipment, says Reagan. Designers reported an increased demand for outboard laboratory benches and panoramic exterior views, access to natural daylight, and better artificial lighting at the task level. Technologies that reduce lighting levels as natural daylight increases have become more common. Exterior window shading and glazing on the exterior of laboratories have also become more prevalent for both comfort and sustainability. Daylight sensors, typically located at a building’s perimeter, read the ambient light contributions from windows and dim the lights in response to the natural sunlight entering the building. Ceiling-mounted occupancy sensors use both passive infrared and ultrasonic sensors to turn off the lights when the laboratory is unoccupied. Not only has the laboratory design process changed, but so have the ways designs are modeled. BIM use in the laboratory design process has become more prevalent, replacing or working in synch with 3D computer-aided design (CAD) software models and other programs like Revit from Autodesk (San Rafael, Calif.). Architects and engineers use this software to create virtual models that enable laboratory owners and users to better understand the laboratory spaces being created for them. The software also allows for the modeling of laboratory equipment—fume hoods, casework, etc.—so the laboratory owners can see how these items alter the space during initial phases in planning/designing. "The highly integrated nature of energy-related innovations requires a much earlier initiation of the decision-making process of these systems, during concepts and schematic phases of projects," says Steve Frei, principal, AEI/Affiliated Engineers Inc., Madison, Wis. The use of BIM has significantly altered how architects and engineers develop and share information among team members and with clients. The same is true of computational fluid dynamics (CFD). "A large portion of a lab's design is dependent on the mechanical systems for air flows. More and more laboratory designers, particularly of the engineering discipline, are using CFD to model how air flows throughout the space," says McCarthy's Joseph. Many AEC firms would like to see more projects focused on energy and water efficiency and conservation. According to Frei, water efficiency and conservation is becoming a big issue, and laboratories need to seek improved ways to handle this. Increased daylighting will become a requirement in the laboratory of the future. Demand controlled ventilation systems, as a mean of realizing increased energy efficiency will become more prevalent, says Stacy Wymann, senior associate, Perkins + Will. Brad Andersen, vice president, life science operations, Merrick & Co., Aurora, Colo., says a safe and efficient way to recycle air in laboratories would save a significant amount of energy. "These systems exist," he says, "but so far have not been accepted by code and so can't be generally used." "As we are living in an increasingly data rich world," says VanDeKerchove, "labs become more wired and the controls systems more integral to their operation. I would like to see us do a better job of 'mining the data' in order to make more informed programming decisions." With growing laboratory support requirements, particularly in life science research, laboratories in the future will have a preponderance of instrumentation and equipment, says Reagan. Laboratory benches will function as instrument platforms or will be nonexistent to accommodate floor standing equipment. However, collaboration and interdisciplinary programs will continue to dominate the laboratory design arena. Kray believes the laboratory of the future will leverage the Cloud and new work styles to provide a collaborative and interactive workplace. "It will be programmed and designed around connectivity, lab and non-lab, resident, and virtual participant," he says. "I would like to see more and larger collaboration areas that facilitate interaction and communication among researchers," says Reagan. "While the increase in specialty instruments and equipment will allow the labs to be more efficient and productive, without collaboration areas in the labs the laboratory space will become impersonal and inhospitable." "A classic topic in the design of any laboratory building is the relationship between principal investigators (PIs) and their labs. In response to studies that evaluate where PIs spend their time, the move has been toward clustering PI offices together," continues Riojas. This promotes interaction among PIs from different projects and fosters a true interdisciplinary laboratory. The art of designing laboratories for the future is to foster meaningful connections among people—whether in offices or laboratories—by creating strategically located, dynamic, technology-enhanced environments where people want to be, says Riojas.